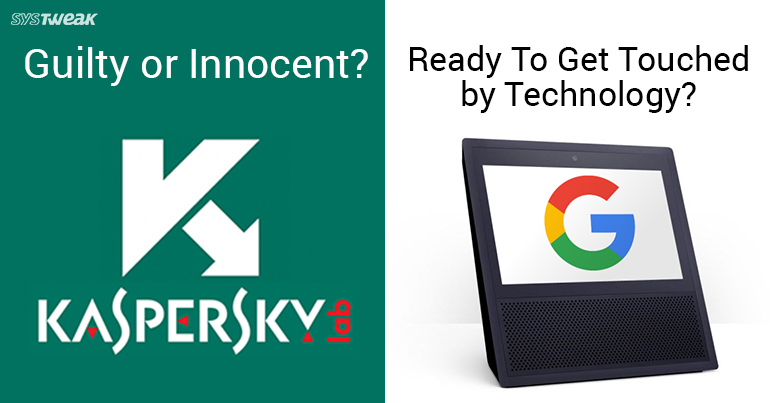 NEWSLETTER: Kaspersky Wants To Prove Innocence & Is There A Google Home Touchscreen Device On Its Way? The Russia based online security firm has repeatedly denied of involvement in covert Internet espionage funded by Kremlin. Just a few weeks ago, we heard how US Homeland Security initiated a ban on all government offices and employees from using Kaspersky software. This was done in face of allegations against the Russian cybersecurity firm regarding their involvement in installing spyware on government computers. Although Kaspersky Labs have totally refuted these charges by the US Government, it has still somewhat tarnished their reputation in the market. But it certainly seems that Kaspersky is not ready to step down and is eager to prove itself innocent. WHAT DID US OFFICIALS HAVE TO SAY? This clearly shows that regardless of what Kaspersky Labs does, they will certainly have a hard time gaining their entry in Federal workplaces. WHY ISN’T THIS ENOUGH TO PROVE KASPERSKY ‘NOT GUILTY’? Although just being loosely accused of possible spying in NSA networks shouldn’t have had much impact, it is the loss of a certain tools that makes the situation a little worrying. As per NSA researchers, the information was stolen using ‘silent signatures’ that are usually employed by antivirus companies to detect malware and sent the report back to the developer for research. These signatures, unlike the regular ones were specially coded to scout and detect classified information and not malware. In Kaspersky’s defense, it is also quite possible that the tools were accidently siphoned after they were detected as Malware by the antivirus and uploaded this information to Kaspersky servers. Whatever the case may be, these are still dark times for Kaspersky Labs that currently boasts of more than 400 million users across the globe. Design leaks reveal a touchscreen smart device code named ‘Quartz’, similar to Amazon Echo Show. While no official announcements have been made by Google yet, a tear down of the Google app shows blueprints for a new Google Home device that is outfitted with a touchscreen display. It includes features such as timer, notifications, video playback, web surfing, photo gallery, maps and forecasts etc. There were traces throughout the code that indicates the possibility of voice command controls, meaning there’s competition for Amazon Echo Show. See Also: Google Home And Amazon Echo Quietly Recording Everything You Say. How To Stay Protected? Although this was already speculated by Techcrunch last month, the code leak has surely stirred up the market. If we were to answer this, we can safely say that Amazon surely should worry about competition. As compared to Google, they have a much wider range of Echo smart speakers in the market. Hence with such a competitive edge, Google would have to come up with some unique features if they want ‘Quartz’ to provide any competition. Nevertheless we still cannot deny that Google as a brand has certainly more reputation than Amazon when it comes to consumer tech. But this competition might be a little different since Echo devices are doing far better in sales. So it is indeed going to be a close call for buyers.